British director Neil Johnson is a favourite around these parts. His sci-fi and horror extravaganzas may not have the biggest budgets or glossiest effects but they're a heck of a lot of fun and from the sounds of it, he's back at it. Johnson's latest sounds like a doozy. 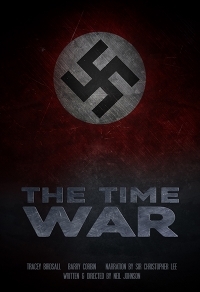 Originally written in 1995, The Time War imagines Hitler going back in time and rewriting history. It's a cool concept and details are vague so it's not clear how far he goes back in time and what history he's re-writing but you can expect things are going to get ugly. After years of being on hold, The Time War went back into production in 2010 and Johnson was so convinced that it would get made that when the opportunity arose for him to work with Christopher Lee, he seized it, inviting Lee to record an opening narration for the film. The Time War is currently in production with Tracey Birdsall and Barry Corbin in leading roles. Below is a better look at the newly released poster for the movie. More to come from the production in the coming months. you mean it actually tells the Truth about Hitler and WWII? I doubt it. The studios would never fund something like that.